How you help Michael Cadena! I found out more information on how Amber got Mikey. She waited until the courts were closed and then filed a missing persons report for Mikey. The police told the Cadena family that anybody hiding him would be charged with kidnapping. She then took the police to his house and got him. Since the judge could not be reached nothing stopped her. She is not allowed to leave the State without permission. State’s Attorney Don Knapp claims she got permission. She is also not allowed to drink or use any drugs. I believe her 6 months in jail was suspended. Michael needs all the help he can get! 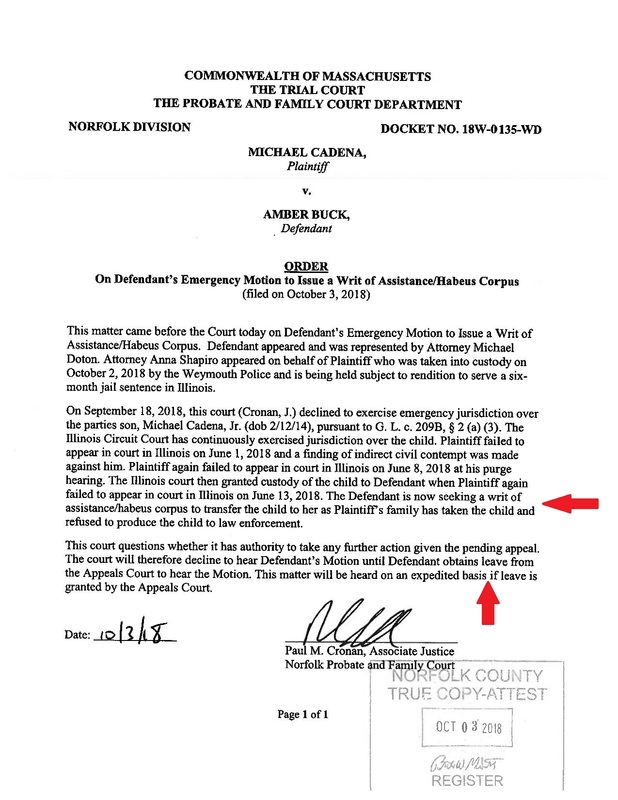 According to this court document filed YESTERDAY, Amber did NOT have authority to go pick up Mikey! Judge Cronin wants to wait until the Appeals Court rules. When I get updates from today’s hearings I will post them. Posted in BloNo, Bloomington, Liberal Media, Local, McLean County.Tagged Amber Buck, Massachusetts court, Michael Cadena, Mikey Cadena, probation. Who is Amber related to? Her parents are Richard and Rose Buck. The Ewing family is connected somehow. Can Mike Cardena’s parents take Mikey in his place until off bail? Are authorities visiting Mikey everyday while with his mother to assure his safety? I pray that you can get Mikey back with Dad before anything happens to him. I will never understand the court system. They always say they want the Best interest for the child. If that is true then get him back with his Dad as soon as possible. So Amber violated parole in order to file a false police report to facilitate a kidnapping and clearly traumatized her son. Definitely the kind of parent the court should be giving custody of an at-risk / previously-abused child. Any way I can I help more? I’ve email all the state reps, multiple child abuse prevention organizations, and the district attorney pleading for help for Mikey. If theres anymore I can do don’t hesitate to ask. The media needs to cover this story, I hear they are seriously looking into it in Massachusetts. Encourage them! Two, actually three, things anyone can do – Ask the Pantagraph why their news is so slanted and tell them if they can’t provide a sufficient answer and/or stop doing so, you’re going to discuss the issue with everyone you know who still subscribes and encourage them to cancel. (That’s #1 and #3ish) Other than that, vote in local elections for people who want to clean up government. It’s hard to get rid of good-ole-boy (and -girl) judges, but if we can gnaw away at their crony base, it not only reduces their reasons for making bad rulings, it helps clean up the pipeline of Future judges so hopefully after Illinois/B-N/McC hits bottom economically, we’ll be better positioned to come back because of less corruption. EVERYBODY needs to vote NO to retention of every judge! Also, the Judge gave custody back to her. Why would she need the judges approval? I’m not trying to be argumentative. I just heard about this today. Is Judge Lee Ann Hill still on the bench… is lawsuits being filed for the misconduct of the Courts. Is Michael (the father) seeking justice for false imprisonment, is the Police of Mass. filing charges against Amber for falsifying information to have access to a child.. causing false arrest, and if not kidnapping, the next closes charge…. is the Attorney for Amber Buck being reviewed by the Bar for possible unlawful acts… Has anyone seen or heard from the child! Does the Parents of Amber have a clue as to Mikey’s where about or physical and mental condition (I retract the last statement, of course not, I tried to erase the photos of the child out of my mind… Apparently, the parents of Amber were on vacation his first two years of existence and apparently has given Amber what she wants and stepped aside again… this case has overwhelmed me on an emotional level… how can this happen, how can a judge refuse to look at the truth in exchange to show how much power she can possess with a robe and stand my that Mother. A Judge with an attitude – just wanting to be a ????? with no consideration of the child… how can you watch that Video and not know someone made some bad decisions…. that little boy was devastated. Four year old saying “I’m sorry”, “I’m sorry” for what, having a Judge that needed to fill her Power, her self satisfaction… I don’t wish bad things on people, but for every hurt, every pain, every tear this child experiences I hope the Judge receives it back ten folds… CHILD ABUSE IS REAL… A CHILD THAT DEPENDS ON ADULTS TO PROTECT AND KEEP HIM SAFE AT ALL TIMES. KUDOS JUDGE HILL, IF THE FACTS HAVE BEEN PRESENTED CORRECTLY, IT APPEARS YOU FAILED MISERABLY AND I HOPE IF THIS CHILD SUFFERS ONE OUNCE THAT YOU FEEL HIS PAIN SEVENTY X SEVENTY! DSS, what is their role in all this, are they stepping up, are they taking any responsibility…or do they choose to turn the other cheek like Hill!!! Wow… this bothers me so bad.. I don’t know this family but my heart… oh my heart reaches out to wherever this little boy resides!!!! Next Post County Clerk debate tonight!